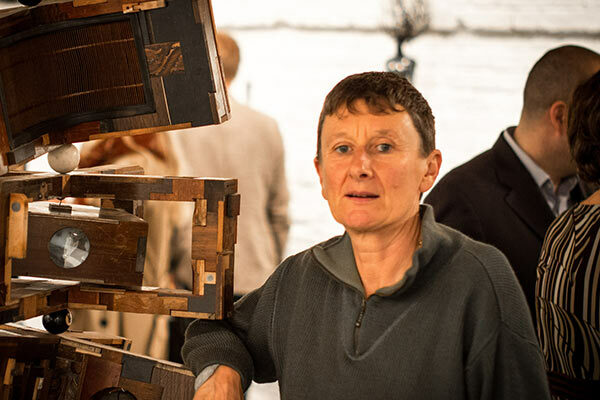 Lesley Hilling’s wooden sculptures are instantly recognisable for their organic elegance and architectural construction. Taking up to a year to complete, Lesley creates her intricately composed utopian towers with embedded objects and relics from the past. Fragile seagull eggs, crustacea shells, dominoes, pocket watches, photographs of Lesley’s family and valves from an old radio, have all been woven into the woodwork. Lesley uses only recycled materials and found objects. This not only saves money, but also cuts down on all the unnecessary stuff in the world. It also gives her the added pleasure of searching in skips for the items that correspond with her imagination. Out with the old and into the new. Her work conveys a powerful sense of longing to preserve the fragments of the past, a desire for order, a passionate and mysterious evocation of lost moments. Lesley has lived in south London for over thirty years and is represented by the Knight Webb Gallery. My work explores two themes – the exterior, architectural layering of buildings and cities and the interior home space. Each with an emphasis on memory, collective and personal, the passage of time and how it impacts upon our lives. I build collages out of salvaged wood, floorboards, driftwood and furniture. It is all re-worked into new forms, jigsawed and layered with an obsessive joinery. I create something new from objects that had a previously different life. My early work shows an interest in openings, compartments and drawers that can house tiny artifacts of memory – a photograph, a shell – a forgotten treasure. These works take the viewer on a journey. The work has to be interacted with – the opening of doors, the pulling out of drawers – an interplay between what is hidden, what is revealed and what is to be discovered. In my most recent work the closed plane has given way to a fretwork of wooden pieces built up in layers that allow glimpses of what lies inside. I imagine lifting the roofs off a row of terraced houses or a block of flats to see how people have transformed their homes and created meaning for themselves, making an identical space completely personal. In my more architectural pieces I make purely structural forms – instead of forgotten treasures secreted within there are layers of greying timber with eroded paint reminding us that people once used, worked and lived with this material.